EU nationals already living in the UK at the point when Article 50 is triggered should be guaranteed the right to settle here permanently, according to the new report of an independent Inquiry into the status of EU nationals in the UK after Brexit, convened by British Future. The Inquiry’s report calls on the Government to make a clear public commitment that the 2.8 million Europeans in the UK can stay, and should be offered Permanent Residence with the same health, social and educational rights as British citizens. After Article 50 is triggered, EU citizens could still move to the UK under free movement rules until we leave the EU – but their post-Brexit status would be dependent on whatever future arrangements the UK negotiates with the EU. The Inquiry panel included voices from Leave and Remain, different political parties and from business and trade unions and was chaired by Gisela Stuart MP, former Chair of the Vote Leave campaign. Its remit was to examine how the Government can protect the rights of the 3 million EU citizens living in the UK after Brexit and to make practical recommendations as to how to do this, starting from the premise that this is the right thing to do. The Inquiry’s report also recommends major changes to the application process for Permanent Residence which, it says, is onerous for the applicant and risks overwhelming the Home Office with one of the biggest single administrative tasks it has ever undertaken. At the 2015 rate of processing it would take 150 years to process the applications of all EU nationals currently in the UK, the report estimates. 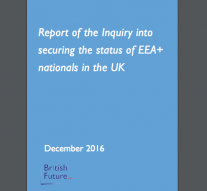 For the two-thirds of EU nationals (up to 2 million people) who have already been in the UK for five years, the Inquiry proposes a streamlined system using Local Authorities’ Nationality Checking Services, who already help people with the paperwork for citizenship applications. It suggests checking these applications more efficiently using existing Government records held by HMRC, the DWP and the Ministry of Justice. The remaining cases would be processed by a dedicated team at the Home Office. The Inquiry also recommends that the costs of applying for Permanent Residence is capped so those affected can secure status with minimum of expense. British Future brought people together for this Inquiry because it was clear they would be able to find common ground, despite being on different sides in the EU referendum and on opposing benches of the House of Commons. There is wide political and public agreement that the status and rights of EU nationals who have made their homes in Britain should be sorted out as soon as possible. ICM research for British Future (1) finds that 84% of the British public supports letting EU migrants stay – including three-quarters (77%) of Leave voters – with any future changes to freedom of movement applying only to new migrants. “We determined that the triggering of Article 50 should be the cut-off date, after which EU citizens moving to the UK would not be entitled to stay permanently after Brexit. This would limit any ‘pull factor’ for EU citizens not already in the UK. “Businesses throughout the UK are very clear that confirming the status of EU migrants resident here is the right thing to do. The evidence the inquiry received showed that uncertainty from valued employees about what will happen to them is tangible in workplaces across the UK. Our members can’t plan for the future or give their employees the assurances they need until government sets out its plan. “the3million welcomes the publication of this report which confirms what campaigners of both the Leave and Remain campaigns said: the referendum was not about the rights of EU citizens living here. We call on Theresa May to take this opportunity to ring fence our rights from the Brexit negotiations now. We are not bargaining chips, we are people. What about the spouses of EEA Nationals who are also here under EU law? I assume the same rules and procedures and settlement will apply to them as well? I wonder if they will be required to take the “Life in Britain” test and pay the £1,250 my American wife has just forked out for her “right to settle here permanently”. What about an EU national having in the past been resident in the UK for more than five years but current working for one of the EU institutions? Your report is well intentioned but the system will be too ponderous. The declaration about the right to stay should be made promptly and a new special status should be established for EU citizens and their dependent families who are here under EU Treaty rules. Local authorities should be instructed to contact all those eligible on their electoral and social service records with added Home Office funding and identity cards could then be issued by them. Cut off point could be June 23rd 2016. Special status to include all rights under current permanent residence plus voting in local elections. Those deported for criminal offences and those without national insurance will not be eligible. Students can be covered by separate legislation. This to cover all EU countries including Croatia, but not new applicants. Much fairer and more efficient. The Government’s choice is actually simple and binary: 1) EU citizens resident in UK at the cut-off date continue regardless of how other states treat British nationals, or 2) EU citizens resident in UK at the cut-off date continue, provided the remaining EU member states reciprocate. Choice 1 is morally superior, choice 2 recognises that other member states may not accept the moral case in respect of UK citizens. Those preferring choice 1 are prepared to let British nationals pay the price of their moral superiority. The way forward is for this lobby group to submit similar petitions to the residences of each of the EU state leaders, the EU Commission and the EU Parliament. Then we will find out which states have the better morals in respect of their overseas citizens.